Forex club was founded in 1997. It is the only company that has the ISO 9001 international quality certificate. The broker is a multiple winner of the “Broker of the year” award. The International Academy of Investments and Trading is a reliable partner and official representative of the company in Russia and the CIS countries. The broker actively participates in developing the governmental regulation of online trading. On the emerging markets, including Russia, Forex Club assists in creation and development of such branch organizations as Russian Centre for Regulation in OTC Financial Instruments and Technologies (CRFIN) and Commission for the regulation of relations on the financial market (KROUFR). The broker has more than 100 offices in 12 countries, including Russia, China, as well as the CIS and the EU countries. Forex Club provides more than 150 instruments for effective trading: 44 Forex currency pairs, 111 CFDs (oil, metals, shares, indices) and also cryptocurrency - for clients which chose another legal field. The company provides its clients with trading platforms developed by itself – Rumus, Libertex, and StartFx and popular MetaTrader 4 platform. Learn more about the company through feedback on this web page. Discuss the quality of services provided by Forex Club and leave your comments or requests. I like Forex Club brokers. I started to go live after using their demo account and I have not found any difference. The Libertex platform is amongst the best I have ever used. Order execution was fine, no slippage, good spreads. Trade with them with $800 deposit, and already withdrawed total $1200. I have absolutely no complaints about it. Really I am satisfied with Forex Club's Rumus account doing forex trading. I choose their Libertex platform, which has so fast execution than others and no spillage. Also, it's organized with a lot of instruments and analytical tools. Which help me to make order easily on the perfect positions. I found many professional trader's technical analysis too. They have live price charts, so I can use an EA and regularly gain some profits. Till now I have withdrawal almost $566 profits via Skrill account. But I didn't get any problem yet. 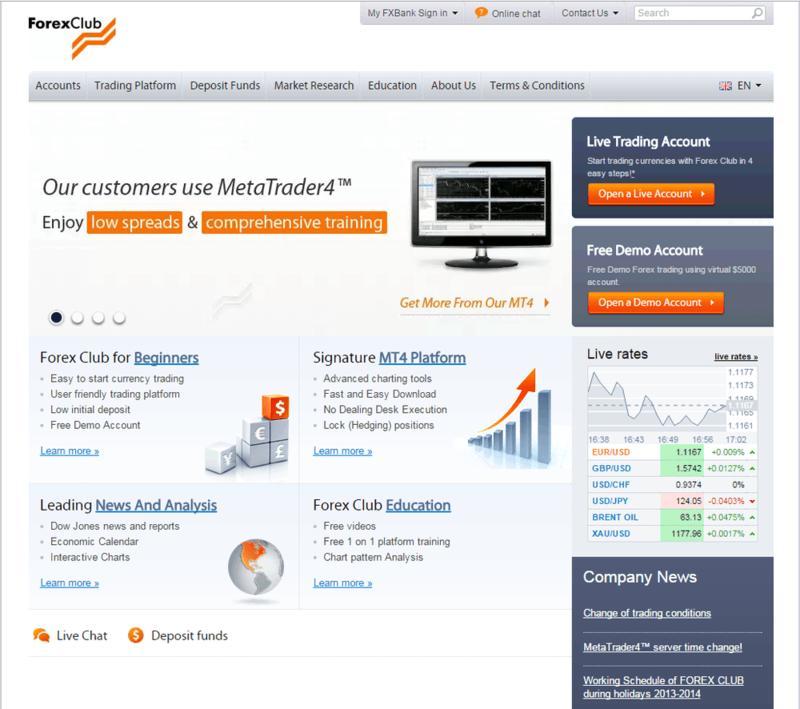 So I believe that ForexClub is a profitable platform for me. This platform is very reliable. It is easy to work with them. Currency charts are very comfortable. Support is extremely helpful and efficient. I just started trading on this platform last week funded with $50 just to test the platform. Deposits are automatic and fast. I have been with forex club for 4 months now, and I have made 3 withdrawals, most of the losss I incurred were solely due to my silly trading mistake. So many times my positions have come to just 1 pip from stoploss and then reversed for a profit. Forex club really an amazing broker, who provided very transparent trading system and the customer support always provide a service that is very helpful and ready to answer the complaints of the client for 24 hours straight. I feel really satisfied enough to trade for 2 years with this broker, because the profit I won almost 50% from my deposit and I also get bonus in my trading. The withdrawal process also never impaired and all is done in about 3 hours. I highly recommend Forex club. Who would have thought Forexclub has a perfect execution of orders? On Monday, I was taken aback when they instantly execute my orders. The trading currencies that I bought those times are EURUSD, USDJPY and USDCAD and take note that time the market was very volatile, yet I managed to place an order with no delays. I managed to buy the said currencies at an affordable and reasonable price. And today, around 8:10AM, I decided to sell those pairs, and as usual, they honored my orders in less than 5 seconds. I couldn't believe that I earned profits today, because I am just a newbie. This is my 1st week of trading with them and I haven't suffered losses yet. Anyway, before I decided to fund my trading account, I trained myself on how to handle my emotions using the demo trading account and it seems effective. :) Later, I will fund my trading account again, because I want to trade metals like Gold and Silver. Hopefully, the result would still be the same. I got into the fx world not so long ago, it was in 2015, I have a silver account, and I could see that Forex Club trading system is fair, for example in my orders I can minimize the losses by means of their leverage, their spreads are not fixed, but commission charged is low about 0,0067% . Their MT4 is easy to work and has a fast execution, spreads on majors like EUR/USD abd GBP/USD are very competirive no more de 1.8 pips. Honest broker, that has a solid reputation in the market. I am quite satisfy trading with Forex club for the last 3 years until now. I never face any issue and the most importantly thing is I have made almost $2000 profit and bonus while trading with them, besides the customer service are always ready to help me even in the night. I feel more comfortable trading with them because they provides its clients with trading platforms developed by itself – Rumus, Libertex, and StartFx and popular MetaTrader 4 platform. I am totally satisfied with Forex club. I started to trade with this broker because I like the low spread on EUR/USD 0.5 pips and the low deposit, only that I lost 500$ trying to trade on the MetaTrader 4 platform. It crashes, it has delays and the support team can't do much. They always say is my laptop or internet problem. I tried to trade from Android and from other desktop but the problem is still there. The support team is not answering my emails or calls. I requested to withdraw the money left in my account after trading EUR/USD and GBP/EUR pairs, it took 14 days to could withdraw. I closed today the account and I am happy! I started to trade with Forex Club after a friend recommend them to me. I liked also their demo account so I opened a live trading account. I trade with them Gold, Platinum, Brent Crude Oil, Bitcoin, EUR/USD, USD/CHF, USD/JPY. The platform works fast and has real time prices, the broker is not manipulating the prices. My monthly profit is 800$ ( +/-). To withdraw and deposit I use the same system Qiwi wallet. I recommend the broker because is honest and has transparent fee policy.